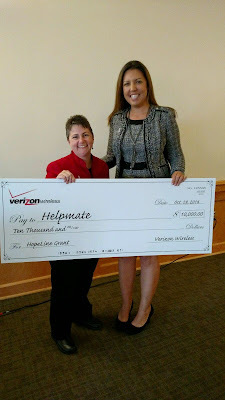 Verizon matched $10,000 raised by Buncombe County residents to support Helpmate during domestic violence awareness month in October. Verizon Wireless recently called on the community in Buncombe County to join them in supporting Helpmate, a crisis-service provider for survivors of domestic violence. The community raised $10,000 and Verizon’s HopeLine program matched it. The $20,000 raised during Domestic Violence Awareness Month will fund victim services. Organizations in Buncombe County, including Helpmate, have partnered through the eNOugh Campaign, which combines law enforcement, civic groups and domestic violence experts in an effort to align resources and decrease the number of domestic violence-related deaths in western North Carolina.